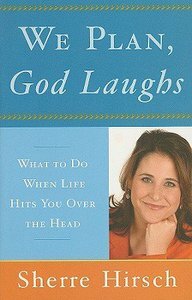 About "We Plan, God Laughs"
Sherre Hirsch was a rabbi at Sinai Temple in Los Angeles for eight years and is the Spiritual Life Consultant and a speaker for Canyon Ranch. She appeared regularly on Noami Judd's "New Morning," She has been featured on "Today," "Tyra," and PBS's "Thirty Good Minutes" and is also a contributor to Momlogic.com. Hirsch lives in Los Angeles with her husband and three children. We have all heard the Yiddish proverb “We plan, God laughs” (Mann traoch, Gott lŠuch), and every time we see on it on a bumper sticker, we laugh too because we know it is true. We all have plans.With each stage of life, we imagined who we would be when we “arrived.” But when we got there, things were not quite in place. Life did not turn out like we expected. In fact, at times life seemed to take another direction entirely. For a lot of us, it felt like we failed. We did not measure up. We are not who we thought we would be. Life is not turning out like we planned. I remember my ﬁrst plan. It was the Cinderella plan. I was going to become a beautiful princess.Then one day my fair and handsome prince would save me from my regular existence.We would fall in love with one magical kiss and live happily ever after. At the time the details were foggy, but the plan was in place. As I matured, the elements of fantasy disappeared, but the dream remained. One day I would fall in love with a wonderful man, get married, have 2.5 children, a house, a dog, and live happily ever after. I never thought about what would happen if the plan did not go as planned.What if I did not meet the prince? What if the prince was really a frog? What if I could not have children? What if housing prices were too high? What if I was allergic to dogs? What if I discovered that this plan was not for me after all? What would happen if this plan didn’t work? My fantasies were not necessarily based in reality. I have learned this lesson over and over.When I was sixteen, my family spent a week white- water rafting. On the ﬁrst day I fell madly in love with our guide. He was a teen’s dream: a cool, tall, tan nature man. I wanted to spend the rest of my life on that raft trip, camping, cooking, and sleeping under the stars. It all seemed perfect on the ﬁrst day. He could quote Thoreau. He could make elaborate dinners on a camping stove. He could lead me around the world on a boat. By the third day I learned he knew only one quotation by Thoreau. Chili was his masterpiece. I get seasick on boats. The smaller the boat, the more severe the illness. By the end, covered in bug bites, exhausted from the experience, starving for the city, a hot meal, and my comforter, I’d realized nature life was not all I had imagined it to be. Just last week I got stuck in the trap again. Before I got married, I had fantasies of Shabbat dinner at our home.We would sit down perfectly dressed at a beautifully set table with ﬂowers, with candles, with the aroma of a gourmet meal wafting through the house. As a mother of three small children, I have found out that if we can all manage to sit together at the table for ﬁve minutes, it is a miracle. We use paper plates because glass shatters. We use plastic tablecloths because wine stains. The candles can never be on the table because my children are little pyromaniacs. And our favorite smell is pizza. So when a Shabbat dinner goes especially wrong, like ours did just last week, it can seem symbolic of something much bigger. Is my marriage in trouble? Do we have “problem” children? You would have thought that in adulthood (having realized that dogs give me hives and apartment rent in Los Angeles surpasses that of most castles) I would have let go of my improbable fantasies and root myself in reality. Even though “I knew,” I still got angry. It felt like God was laughing at me. He was making a mockery out of my life. If God and I both knew that Cinderella was not real, why was I still waiting for my “happily ever after”? It never occurred to me that God might be waiting for his “happily ever after” too. God too may feel that some of his plans have not gone as he wanted and that we were laughing at him. It all started with Adam and Eve.They had only one rule, and they broke it. Cain killed Abel.The Israelites begged to return to Egypt. Moses broke the ﬁrst set of the Ten Commandments. God plans, we laugh. God has a sense of humor.With the birth of Isaac, God claimed the true meaning of laughter. Laughter was possibility, not mockery. Laughter came to represent joy, creation, love, faith, and passion. The tradition teaches that on the day Isaac was born there was so much of this new laughter in the world that women who had previously been barren gave birth. People who had been sick were healed. On that day, the day of Isaac’s birth, the world was ﬁlled with true joy. It was ﬁlled with laughter.